Seeing the joy on a loved one’s face when they’re handed a gift is one of the most rewarding moments. If you’re looking to wow your family and friends the minute they receive your gift, then a little creative gift wrapping is just what you need. Luckily, it doesn’t take much time, skill or money—once you have a few gift wrapping ideas. To offer you inspiration for your Christmas, birthday or holiday gifts, we’ve created a collection of over 20 gift wrapping ideas. From simple ribbon techniques to gift-wrapping masterpieces, we have something for everyone. If you need to save time but still want to give a personalized gift, you can browse our custom gift wrap. Design your own festive gift wrap from a material you already have: paper shopping bags. Make the project easier by choosing bags from stores that issue holiday patterns. Add colorful ribbon or string to your gift for extra personality. Choose a gift wrap idea that also doubles as a gift: a tea towel. Bundle a bottle of wine, olive oil, sauce or balsamic vinegar for a present that will go straight to the kitchen. Gather your paints, paintbrushes and sponges. Use white or solid colored paper as your base and sprinkle on all of your favorite colors in any shapes you want. Your gifts will be dressed full of character and personality. Take empty cardboard boxes from rolls of parchment paper or foil. Paint them with festive colors and designs for decorative baked good gift boxes or other food gift ideas. Christmas lights aren’t just for hanging on your roof. Cut open brown paper bags to create your wrapping material. Then, draw or paint a set of holiday lights on the paper for a jolly feel. Cut bow shapes out of colored cardboard construction paper. Use an online printable for a cutting guide or make your own stencil. For a tasty twist to this project, fill the centers with a teaspoon of sprinkles. Dress up brown paper gift wrap with fine string or ribbon. Add a gold foil holiday tag for a gift wrapping design that looks polished and professional. Washi tape isn’t just for home decor. You can use it to dress up your gift wrapping, too. Create a layered effect by weaving the tape horizontally and vertically in an alternating pattern. Wrapping gifts for your kids, grandchildren or nephews? Create your own interactive gift wrap by gluing on their favorite toys like cars, crayons or building blocks. Add a little fun to your gift wrapping project by designing bows out of origami paper. Fold several at a time so you have a stock of bows to use throughout the year. Wrap your gift in plain brown paper, then use a lustrous silver pen to add details. Draw geometrical shapes, snowflakes or simple lines to accentuate your package. For easy Christmas wrapping, choose solid-colored paper and a simple gift tag. Add a bit of rustic flair with evergreen branches secured with decorative cord or twine. Make your gifts jingle with joy. Fasten tiny bells to your packages using string. Choose a color of string or twine that complements your wrapping paper. Giving baked goods away this Christmas? Wrap your holiday treats in kraft boxes lined with food-safe tissue. Adorn the outside with striped ribbon and a twig of holly for a very merry look. Deliver your gift cards in style. Create snow globes out of used jars, like old salsa or pickle containers. Wash them out thoroughly using boiling hot water to remove any smells. Tuck your gift card into the jar and fill with glitter and water. Jazz up brown paper wrapping by painting on polka dots. Stay neutral with white paint or choose any color of the rainbow. Your packages will look professional but at a fraction of the cost. Get your gifts dressed for the party! Sprinkle your paper with colorful dots, using paint and a cotton q-tip. Open your medicine cabinet for this easy gift wrapping idea. Arrange cotton swab q-tips in the shape of a snowflake and glue it on any color of wrapping paper. Transform a plain brown bag into festive Christmas gift wrap. Secure pieces of tissue paper to the bag and cut small strips to create the fringe effect. You can also use this gift wrap idea to dress up your DIY Christmas decor ideas. Find butcher paper at your local craft store and get out your watercolor paints. Use an abstract design to create a tie-dye appearance. Pro tip: choose colors that blend especially well together. If your child is making a gift for their teacher, turn this gift wrapping idea into a fun activity to complete the presentation. Who knew graph paper could be utilized as gift wrap? Cover your packages with this mathematical material and fabric tape. Align your tape along the straight guidelines of the graph paper. Fashion pom poms out of yarn to create a spirited gift wrap accent. Customize them in your favorite colors and tie them to all of your packages—both large and small. Design a unique chalkboard look by layering white marker on top of black paper. Write a thoughtful message or draw customized designs for your loved ones. Have your gift wrapping ideas ready to go? 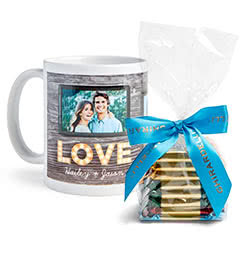 Seal the deal with a practical or personalized gift for your friends or family. No matter how hard they are to shop for, you can select truly unforgettable gifts by using our holiday gift guide.